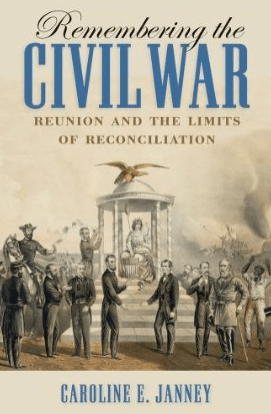 David Blight’s Race and Reunion: The Civil War in American Memory has dominated the historiography of Civil War memory studies since its publication in 2001. Beyond academic circles, Blight’s emphasis on the triumph of reconciliation over an “emancipationst narrative” can be found in documentaries, news articles, and even historical tours. Rarely do historical interpretations enjoy such popularity. In recent years, historians have chipped away at various aspects of Blight’s view. Two books that stand out in this regard are John Neff’s Honoring the Civil War Dead: Commemoration and the Problem of Reconciliation and Barbara Gannon’s recent study, The Won Cause: Black and White Comradeship in the Grand Army of the Republic . While both books are important contributions to the field they do not approach the scope of Blight’s study, both in terms of the time frame and topics covered. These and other studies, along with an even larger number of scholarly articles, have shown that reconciliation did not always triumph, bitterness remained among veterans, and memory of slavery and emancipation may have been more vibrant throughout the postwar period than we thought. At the same time we do need to explain why our memory of the war since the 1960s has emphasized reconciliationist themes that go back to the turn of the twentieth century. In other words, we don’t want to err by minimizing the pull of reconciliation. Caroline Janney’s forthcoming book, Remembering the Civil War: Reunion and the Limits of Reconciliation promises to be the first broad study of Civil War memory since Race and Reunion. She’s been chipping away at various topics, including the Appomattox Peace Monument, the Heyward Shepherd Memorial, and the establishment of the Chickamauga and Chattanooga National Military Park. For a taste of what you can expect in this book check out Carrie’s recent talk from the 2012 Civil War Institute. I look forward to Carrie’s study! Thanks for the citing the Won Cause. I’ve started to listen to this and I, too, look forward to the book. She’s a very engaging speaker and really gets your attention. Bummer reviewed Carolyn’s presentation and was thoroughly impressed with her style and deportment. Her explanation of union veteran transition on why they fought, years after the conflict, reinforced many oral rememberances of family members of the early 1900’s. I believe most situations have vast complexities and nuances. However, it is important to look at the result. The fact is that, when Glory came out, a lot of people were astonished to find out about the the black contribution to the Union military, especially its extent and the number of combat troops involved. I was approaching and reaching adolescence during the Civil War centennial and the amount of literal white washing was formidable. The popular TV shows that involved Civil War characters tended to focus on Confederates like John Mosby as the hero.